At the outset Balthazar briefly summarizes his own intellectual journey as an economist, looking back on his earlier assumption that the economy as a whole was the spontaneous result of innumerable interacting trends interacting in a complex manner, and could be ultimately traced to individual preferences. This is the common perspective of most mainstream economists, who view the economic system as something that “just is,” arising naturally or inevitably, and not the result of power or vested interests. Balthazar gradually came to question this assumption: Is our economic system really something that “just happened,” because most people want things more or less this way? He noticed, in particular, the absence from public debates of any consideration for the possibility that a majority of people, absent institutional constraints, might have preferred increased leisure over increased consumption. From there he considered the destructive effect such a preference would have on the conventional economic paradigm of avoiding idle productive capacity and idle investment capital, and preventing general deflation. The long-term results of abundance and leisure — post-scarcity — would be the collapse of capital asset and securities values, the collapse of the tax base, and default on public debt. In examining this question — whether an economic system geared towards consumption rather than leisure is truly the result of spontaneous individual preference — Balthazar goes back to Keynes’s Economic Possibilities For Our Grandchildren. In that work, Keynes envisioned a world of superabundance and leisure, with an average work week of 15 hours, by the year 2030. He considers whether Keynes was correct that the natural outcome of technological advances in productivity, absent any institutional forces to thwart that natural course, would have been a future society of increased leisure and abundance, and radically reduced work hours. And if he was correct, what institutional forces have prevented that outcome? Balthazar suggests that the institutional mindset of those making macroeconomic policy, and the Keynesian orthodoxy itself, are geared toward maximizing the utilization of production capacity, finding profitable outlets for investment capital, and avoiding deflation. These institutional goals of American capitalism, and the capitalist state, are directly at odds with the possibilities of a post-work, post-scarcity society. And the economy’s tendency towards increasing GDP rather than leisure may reflect, not the sum total of revealed individual preference, but systemic imperatives. We face the real possibility that, far from a case in which we are the principals and those in charge of the economy are honest agents — with the state reflecting the spontaneous preferences of the public and the corporate economy functioning as a sort of “dollar democracy” — the actual state of affairs is one of the alleged “agents” pursuing interests of their own and using the “principals” as means to an end. Specifically, the doctrine of “economic maximalism,” or growth for its own sake, is at the heart of a legitimizing ideology actively promoted by all the centers of cultural reproduction, that not only present growth and increased consumption as desirable, but present a state of affairs in which these goals are maximized as natural, inevitable, and — yes — the “spontaneous outcome of individual preferences.” In short, we live in a system whose complex of ideological institutions conditions to view its dynamics as a fact of nature rather than something that results from the application of power and reflects the interests of those who are in control. The system conditions us to believe in a legitimizing ideology, that is, precisely identical to what Balthazar himself believed fresh out of school. In developing this thesis, Balthazar first does an in-depth content analysis of political and economic commentary on the Great Recession in The Economist, examining the ways in which the overwhelming dominance of the economic maximalist ideology in the pages of that publication. In all its commentary and reporting, The Economist took for granted that getting people to work and consume more was the only common sense path, and that the desirability of these things was an overwhelming collective social consensus. He next conducts a broad survey of the history of political economy to trace the origins of that ideology, and the path by which it attained the status of orthodoxy. Especially interesting in this regard is the prevalence, in the political economy of the 18th century, of the idea of the spontaneous preferences of ordinary working people as an obstacle to be overcome, and the need to coerce or manipulate them — for the sake of some “higher good” — into working harder than they would have chosen to if left to themselves. And as I have documented elsewhere, there is a large body of commentary by propertied advocates of Enclosure arguing that depriving the rural population of their rights to subsistence on the common was absolutely necessary to get them to work as hard as their masters wanted them to, rather than simply working until their own perceived wants were satisfied. And even Adam Smith, Balthazar notes, for all his break with mercantilism, shows a great deal of continuity with it in treating the good of the commonwealth as a thing in its own right over and above the revealed preferences of actual working people. In this he anticipated commentators today who treat the “economy” as an end in itself. The most egregious example I ever heard was a neoconservative commentator on one of the cable news channels during the Iraq War in 2003, gloating that Americans preferred to work longer hours and forego the six weeks of vacation their German counterparts enjoyed so that “their country” could afford to maintain carrier groups in the Indian Ocean. searches plausible alternatives to the tendency of markets to commodify both goods and labor services. More generally, this literature is searching for production and exchange arrangements that rely on motivational frameworks other than the hedonistic self-interest of homo economicus. 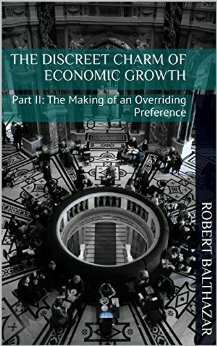 Balthazar finishes his essay by drawing the conclusion that there is no basis, either in neoclassical economics or in any generally accepted moral theory, for justifying the commanding institutions of our society in promoting growth maximization as a systemic goal overriding individual preferences. One thing that would have benefited this essay — and it’s odd that it’s missing, considering Keynes’s scenario in Economic Possiblities For Our Grandchildrenassumed technologically-based increases in productivity — would have been for Balthazar to address the possibility that technologies could actually increase consumption (in the sense of use-value) even as labor hours and nominal GDP decrease. The problem is that, in the context of post-scarcity technologies, the very concepts of “growth” and “consumption” are ambiguous. Traditional metrics of “growth” like GDP measure the total monetized value of inputs like material resources and labor consumed to create a given unit of consumption. But as smaller and smaller amounts of labor are required to produce the same use-value, and the ephemeralization of production technology has the same effect on capital expenditures and natural resource inputs, use-value is increasingly becoming decoupled from exchange-value. To take the extreme example, in a world of Star Trek matter-energy replicators the possibilities for consumption of desired goods would be for all intents and purposes unlimited — and yet both GDP and ecological footprints would be virtually zero. As technology pushes us into the realm of abundance, the material standard of living improves even as the processes by which we produce that standard of living disappear from the cash nexus. I examined this phenomenon at some length in an article for the P2P Foundation Blog, “Abundance Creates Utility But Destroys Exchange Value” (Feb. 7, 2010). From this standpoint, the state’s Hamiltonian policy of propping up the artificial exchange value of material inputs and labor and creating an artificial need for them — snatching scarcity from the jaws of abundance — serves the same function as the artificial scarcity imposed by the landed classes of England in the Enclosure movement. It compels laborers to do extra, unnecessary work in order to support a parasitic class in addition to themselves, and encloses the production process within the control of an institutional structure that serves no technically necessary function. An explicit examination of the autonomists (particularly the “Exodus” model Negri and Hardt discuss in Commonwealth) would also have been of value in Balthazar’s treatment of the fourth narrative. That is, their thesis that networked communications and other modern technologies are reducing the significance of physical capital, making human social relationships in society at large increasingly the most important factor of production, and blurring the lines between social life and work in a way that makes the capitalist and wage employment increasingly superfluous — and overdue to be bypassed. The section in which Balthazar discusses Mauss and Polanyi on gift economies would have benefited from some reference to David Graeber. Finally, it’s worth noting that analysts as far back as Kropotkin’s Fields, Factories and Workshops have argued that it would be possible to immediately reduce the work week to 15 hours with no reduction in standard of living, simply by eliminating waste production, guard labor, and the surplus labor consumed by rentiers. Overall, I recommend Balthazar’s essay highly as a contribution to post-scarcity literature. Robert Balthazar. The Discrete Charm of Economic Growth. Part I: The Bilinguals; Part II: The Making of an Overriding Collective Preference(2016). This work contributes to advanced discussion on the theory of scarcity and employment in developing economies. The Keynesian and post- Keynesian economics has developed through criticism and counter-criticism. This work further develops the scope of welfare economics and its uses in modern world.